Most runners have a love-hate relationship with their feet. Because runners' feet endure the brunt of the repetitive pounding of the sport, black or missing toenails, blisters and callouses can result from a long run or race. But there are more sinister ways that foot pain can stop runners in their tracks: stress fractures, tendonitis and soreness that isn't "normal." The foot is an incredibly complex extremity made up of a network of bones, tendons, ligaments and muscles that all have to work together in harmony. One disgruntled cog, and the whole machine can stop functioning. The following four foot injuries are the most common ailments. Learn what causes these types of foot pain and, more importantly, how runners can avoid the dreaded "I" word. Nearly every runner knows the plantar fascia tendon that runs lengthwise across the bottom of the foot. Plantar fasciitis is that sharp, stabbing pain at the bottom of your foot. As with all tendonitis issues, the beast can rear its ugly head sometimes out of nowhere and drag on for what feels like an eternity. 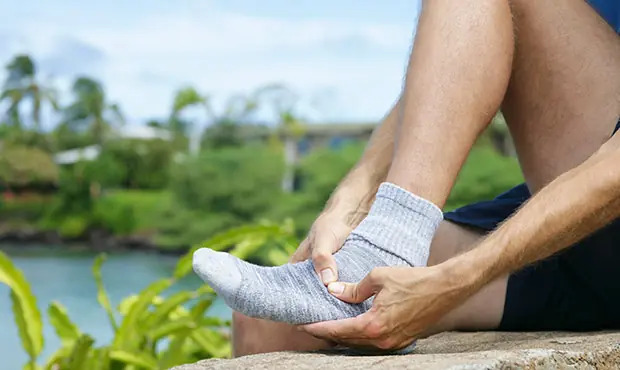 An overuse injury, plantar fasciitis can be caused by a biomechanical issue, improper running shoes, increasing training volume or intensity too quickly, or even from tight or weak calf muscles—the body is an interconnected machine, after all. Treating plantar fasciitis is a matter of identifying what your root cause is, making sure you're running in shoes that offer enough support, and possibly using an insert or orthotic. "I developed plantar fasciitis during my racing season and looked to inserts since taking time off was not yet an option," says Sergio Gonzalez, PUMA athlete ambassador, who has run 3:48 for 1500 meters. "I found the RUNPRO by currexSole to be extremely beneficial. The precise fitting system helped me select the correct insert for my aching foot, while the dynamic support allowed my foot to flex and function naturally, giving my foot the comfort it needed to move through its normal range of motion and heal at the same time. I noticed a difference rapidly." Treatment is ongoing, and once the pain subsides, runners who are prone to plantar problems should continue to stretch the feet, and roll the affected foot on a tennis ball or frozen golf ball. Stress fractures are a bone issue or fissure that can be present in any of the many bones comprising the foot, but fractures occur most typically in the metatarsals. Stress fractures tend to be a slow-building issue, but then all of a sudden a moment comes when you feel a sharp pain of the bone fissure. Afterwards, it can be hard to distinguish if the foot pain is a bone or tendonitis problem. Even X-rays can be unreliable; it's possible that nothing will show up until there is actual healing going on in the bone. Your doctor may order an MRI or bone scan to look for a stress fracture. A "common man's" test for a stress fracture is to place a tuning fork against the foot. The vibrations will basically rattle the bones, and if you've got a stress fracture, you'll certainly feel the pain light up. Another at-home test: Try to hop on one foot. If the impact causes pain, you've likely got your answer. Note that these at-home tests shouldn't be used for self-diagnosis or in place of seeing a doctor. If you suspect you have a stress fracture, see your physician or sports medicine doctor for a proper diagnosis. Stress fractures are usually caused by rapidly increasing training volume and/or intensity, but they can also happen if you're unlucky enough to step awkwardly on a rock, root or pothole. If you have a stress fracture, there's no way around taking time off from running. It takes about six weeks of non-weight bearing activity for the bone to heal properly. Cross-train like a champ, wear a boot, and enjoy the mental break from running. The good news: Unlike a tendon issue, once a stress fracture heals the pain should be gone for good. Caitlin Chock set the previous national high school 5K record (15:52.88) in 2004. Now a freelance writer and artist, she writes about all things running, and founded Ezzere, her own line of running shirts. You can read more, see her running comics, and shirts at her website www.CaitChock.com. Follow her on Facebook and Twitter @CaitlinChock.